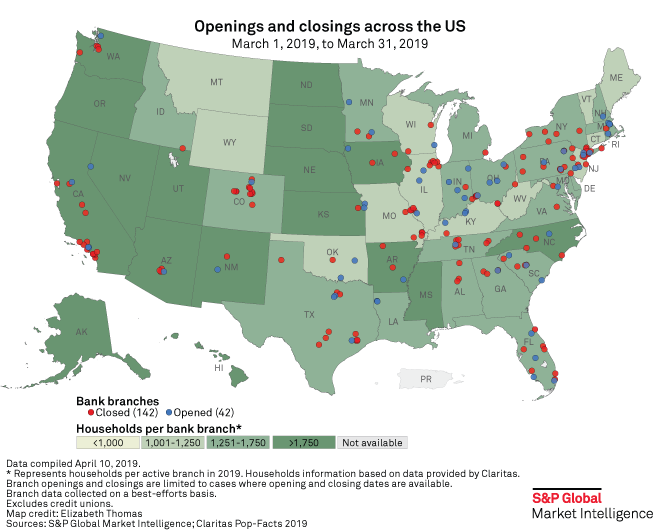 U.S. banks and thrifts continued closing branches in March, shuttering 142 locations while opening 60, for 82 net closures, according to S&P Global Market Intelligence data. By comparison, a net 100 branches were closed in February. Over the last 12 months, U.S. banks and thrifts have closed 2,980 branches and opened 1,023. As of March 31, there were 87,029 active branches in the U.S.
U.S. Bancorp closed 21 branches in March, the most of any bank, followed by Wells Fargo & Co. at 17. BOK Financial Corp. and PNC Financial Services Group Inc. were the only other banks with double-digit net closures during the month. Indiana and Louisiana had the most net openings in March, at two each. New York led the country with 12 net closures, followed by California and Colorado with 11 and 10 net closures, respectively. Click here to access a template containing bank branch openings and closings for March 2019. Click here to generate market share reports for specific companies or U.S. markets.